We glad to present today‘s selection of Artworks and we start with the Artist who we presented in the last magazine. There are few reason for that first, because such artists are newcomer to Steemit, they need a bit guidance and support and just help them once and then forget this is not right. So we usually keep on eye on them and make sure that now they can swim themselves in this ocean of blogs and posts and strong enough. Then they do not need our help and we just pick up some new. 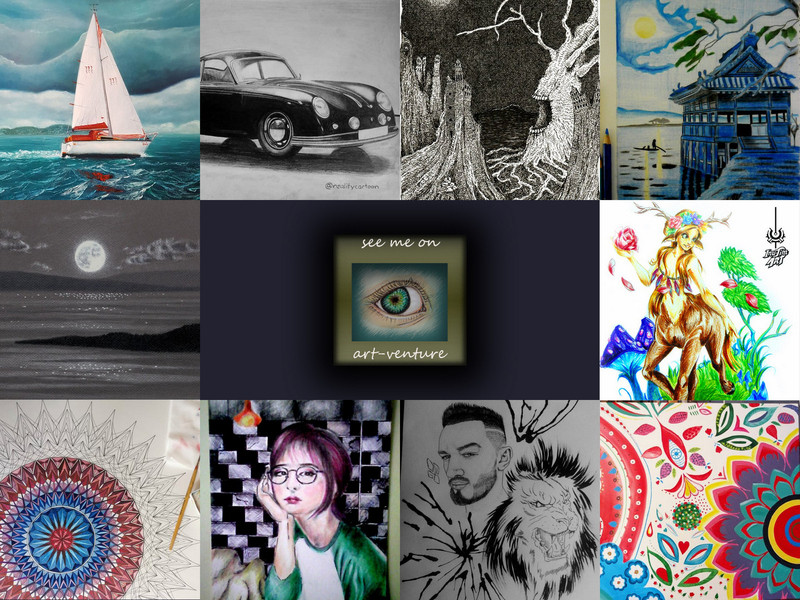 Also just an advice, dear Artists, if you want more exposure for your works use tag #ocd-resteem, the Curator from OCD looking through that tag and you might be lucky one who will be selected and Upvoted, that worth to try! Francis @escfrancis presented beautiful portrait drawing, you can see the photo reference too, well done and structured, so we can see how the work been developed. Good job, Francis! Our old friend Leonardo @artistleonardo is sharing his secrets, that is always so precious to learn how Artists have done this or that work and at the end you may even think, Hmm… I also can do that! Go ahead and try! Thank you, Leonardo, like it very much! Our friend from last magazine @realitycartoon presented his work Porsche 356, amazing pencil work, love it, our Upvote for this work! @inu-jim presented her work of mystical creature Fantasy Art and we decided to include it, the most interesting is the initial sketch when the Artist is trying to put her idea on paper, rough version but there is everything in it. Very good work! Anthony @achristopherart with his works, the artist who you recognize easily, some of the details are so tiny that require enlargement glass, and the sizes of work is large format, that sometimes the whole process can be lengthy, our respect and support! Absolutely beautiful sunset drawing by @stefaniaveliz, nice colors and great combination of blue and yellow, the branch of tree with green is perfectly placed into scene, as product of yellow and blue. Detailed architecture, nice peaceful drawing! Next work is watercolor colored mandala by @ayushijain, watercolor itself difficult medium as you should mix colors in advance and work relatively fast, in Mandala there are a lot of small details, that require still hand and patience. Great work and our support! Finally Folk Art pattern presented by @martist, looks simple initially, but while looking through process photos you can see how the work is progressing and becoming more complex and colorful. Beautifully done! AND…… , please visit Art-venture contest that is run by @xpilar and @sultan-aceh, to choose the winner of Art-venture magazine issue N44.